Late last night we sailed away from the last island that we will visit during our stay in PIPA, Nikumaroro. After leaving Winslow on the 31st, it took us almost two whole days to reach Nikumaroro, one of the southernmost islands in the group. Spatially Nikumaroro looks almost identical to Kanton, just a little bit smaller. They both have the same tear drop shape, oriented in the exact same direction, with a central lagoon in the middle that is connected to the ocean by one central channel. The similarities end there though. The two degree difference in latitude between the two islands is enough to change rainfall patterns such that Nikumaroro has lush green vegetation with a thriving palm tree population, very similar to Orona. Beautiful beaches with coconut trees and coral rocks lined the shore on Nikumaroro. While we were at Nikumaroro, there were squalls every night, something we hadn't really experienced at all since arriving in PIPA three weeks ago. Getting onto the island at first seemed quite challenging. There is a continuous shallow reef shelf that encircles the island, making landing near impossible. However, during a British colonization effort here in the early part of the 20th century, they blasted a landing strip through the coral all the way to the beach. While we would never think about doing something like that today, we had no problem taking advantage of the passage they made. Other signs of past human history were not as obvious on the island. Other than a shipwreck that sits prominently at the entrance to the lagoon, we only saw what looked like the foundation to an old building and an old irrigation system. Coconuts of course have a large presence on the island as well though. Walking through the forest consisted of alternating stepping on old coral pieces and dried coconuts. appear to be too large for the rats to have much of an effect on, so they are thriving on Nikumaroro. While Nikumaroro was one of the prettiest islands we've visited, the reefs there were in pretty bad shape. The ocean side was pretty similar to a lot of the other islands in the area. Evidence from earlier bleaching events are still obvious. Recovery is very slow, but is happening. Again there was also a lot of shark activity in the waters around Nikumaroro. 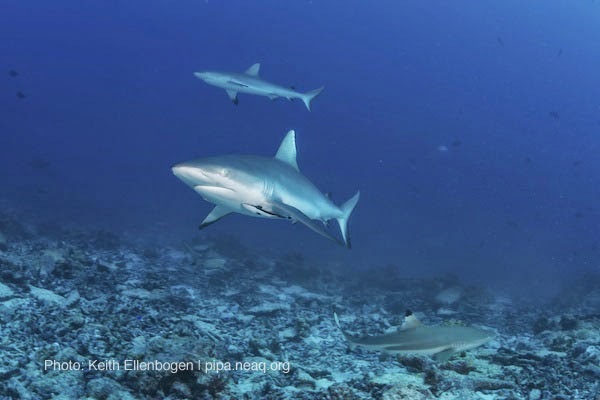 Pretty much the entire time we were anchored at Nikumaroro there were three or four large black tip reef sharks that circled our ship. They were really cool to watch and by far the best viewing we had of adult sharks in our time in PIPA. Inside the lagoon was where things really didn't look good here. The water was warm, murky, and discolored, kind of a yellowy red in some places. There appeared to still be lots of fish and sharks there, but the waters were not very inviting. Iannang Teatoro, one of our two representatives from Kiribati onboard, visited Nikumaroro in 1996 as part of a government survey of the island for future habitation. He said these lagoon conditions were totally new since then, and that before it had been like other lagoons in the Phoenix Islands. He specifically mentioned that there used to be lots of colorful giant clams on the edges of the lagoon, which are no longer present. 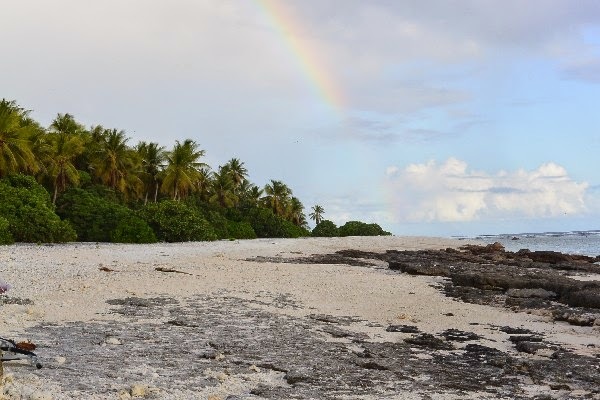 Although Nikumaroro seems to be one of the islands most affected by recent bleaching events, many people said that this was their favorite island. 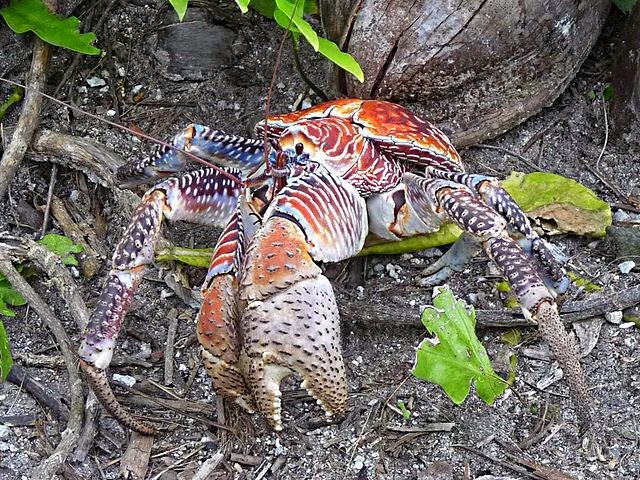 With lots of sharks, a coconut forest, archaeological sites, coconut crabs and beautiful beaches there is still a lot to like about this island. We are now making our way out of PIPA and towards American Samoa. It will be a busy stretch of project work, intense sailing, and finalizing any last things on the ship.